In the Albert Brooks comedy Mother, Brooks' character moves back home to sleep in his childhood room as he reexamines his life. Lately, as my oldest child progresses through his own childhood, I've been finding myself in several Mother-like situations drenched in surreality. Today was another example of such a moment. The last time I remember skating was at Rennie Park when I was 12. It was the final game of the season for my team, the CN Towers, and I was going to be moving up a division as a 13 year old. 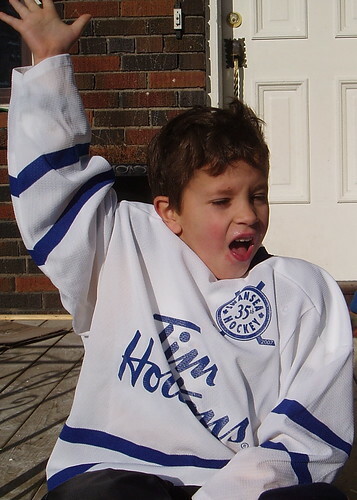 There was body checking in the next division and I wasn't a very big kid, so I decided to hang up my skates and focus on my blossoming ball hockey career. This morning I found myself at that very same Rennie Park, tightening my new skates as I prepared to take the ice for the first time in twenty years. It was the same old clubhouse, with those change rooms I remember well, and although the actual rink had a face lift recently, it was like getting caught in a time warp. This time though, it wasn't about me, it was about helping James learn how to play hockey. Most parents opted out of this part of the program, preferring to watch their kids from behind the glass. I was one of four dads to participate and I'm proud to say I didn't fall once. Compared to a bunch of 4-6 year olds, I was actually pretty damn good. I can't wait for next Saturday when I get to do it again. It wasn't just getting out there on that familiar ice that was fun, it was doing it with my son. The coaches do a great job of instructing, but being there to reinforce points and help James along is pretty awesome. He got #6 and was thrilled when I told him it was one of only two numbers retired by the Leafs. I've been involved with both my kids in baseball for 8 years & will again be coaching this year. Parents have to get involved as well in any capacity with their childs team. It's a special bonding that me & my kids still have.